My parents had a globe when we were growing up where they would show us places we were learning about and my brother and I would spin it so hard it would fall off the table. Woops. Of course, that globe became outdated after the USSR fell, so I'm sure they put it in a yard sale. 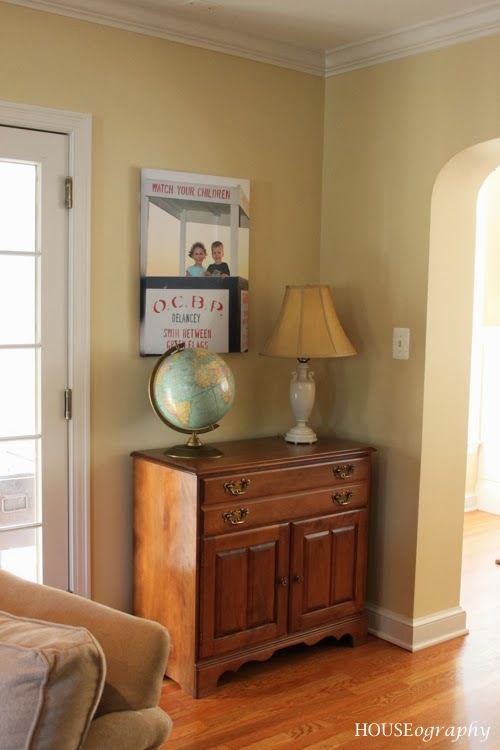 I don't know what happened to that globe, but I found a similar one at Goodwill last week and I loved it. It was a bit grubby (is anything at Goodwill NOT grubby?) but I knew it would clean up fine. I had no idea where I was going to put it, but I liked it and it was only $4.95. The kids loved it when they saw it on the kitchen counter so I decided to put it in a prominent place in our living room at least for now. This cabinet top has always had a bit of an identity crisis, so now it doesn't. In case you were wondering, I have tons of craft and art supplies stored in here. Fortunately, I have not yet had to explain the Cold War to my 7 and 4 year olds!